Viareggio is the southernmost Italian Riviera resort on Italy's Mediterranean coast and the largest beach town in Tuscany. Liberty-style buildings housing shops, cafes, and seafood restaurants line its promenade and there are several good Liberty-style villas, including one built by Puccini, in town. Although Viareggio was at its peak as a resort in the early to mid-1900s, it's still a top Tuscan town for beaches, seafood, and nightlife. It's also known for holding one of Italy's top carnevale, or mardi gras, festivals. 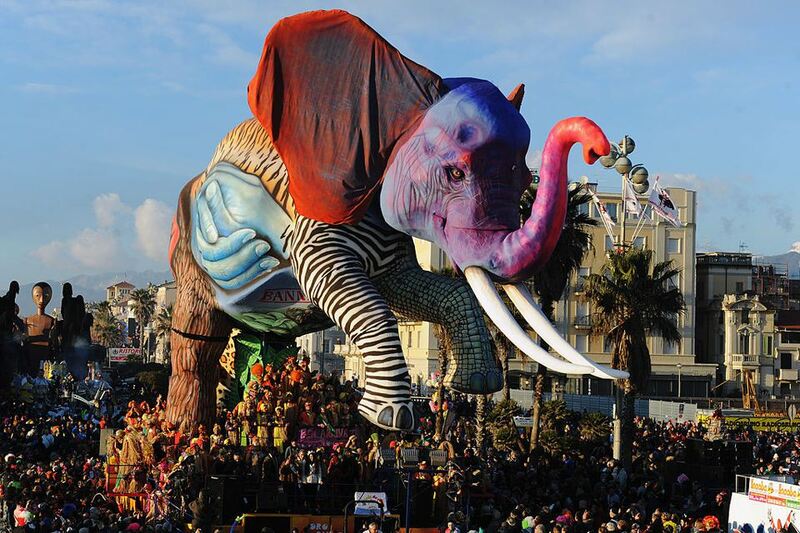 Viareggio holds one of the largest and most celebrated carnival festivals in Italy, drawing more than a million people each year. The famous parade features wildly elaborate floats, many of which are timely commentaries on current political or societal issues. The parade runs along the seafront promenade and is usually held the three Sundays before carnevale, the day of carnevale (Shrove Tuesday), and the Sunday following. Admission is charged for the parades. Theater, music, masked balls, and other events are held during the carnival season, too. There's even a carnival museum in town. Beaches - The coast is lined with sandy beaches, most part of privately owned facilities although there is a free beach area in the south part of the city. For a price at the private beach establishments, you get a beach chair and umbrella and use of facilities like changing rooms and restrooms. Most facilities have a snack bar too. The sea is usually calm and good for swimming. Promenade - A long seafront promenade lined with shops, cafes, and restaurants runs between the beach and town. The south end has Liberty-style architecture. The promenade is the place to see and be seen, especially during the evening passeggiata. Pineta di Ponente - The large pinewood park, just two blocks from the beach, is a good place for walking and escaping the sun. Piazza Shelley - One of the town squares is named for English Romantic poet Percy Bysshe Shelley. It's a pretty green space with benches and a bust of Shelley, who drowned off the coast near Viareggio in 1922. Villas - Villa Paolina near Piazza Shelley, was commissioned by Napoleon's sister in 1822. Several Liberty-style villas were built in the countryside in the early 1900s and the town of Viareggio later developed around them. Villa Amore, on the main street along the sea, was the first, built in 1909. One of the best examples of Liberty style is Villino Flore, built in 1912. Villa Puccini, the composer's last villa, is on Via Belluomini, around the corner from Grand Hotel Principe del Piemonte. You can see the villas from the outside but they are not open to visitors. Museo Cittadella del Carnevale - The Carnival Citadel Museum has an exhibition of floats, masks, carnival postcards, and other memorabilia related to carnevale. Viareggio is on Italy's west coast in the area of Tuscany known as the Versilia Coast. It's about 20 kilometers north of Pisa and 30 kilometers west of Lucca. Many hotels are found near the beach and some have rooms with sea views or private beaches. Villa Tina was one of the first Liberty style buildings in Viareggio and the 3-star hotel still has period furniture and decor. Grand Hotel Principe del Piemonte, dating from 1922, is one of the historic hotels and is reminiscent of Viareggio's heyday. Il Principino, on the seafront across the street, was Viareggio's first beach resort built in 1938. See more top-rated Viareggio hotels. There's a small fishing port in Viareggio and you can expect good seafood made with fresh fish at most restaurants, especially those near the port area. Viareggio is on the rail line that runs along the coast between Genoa and Rome. It's just off the A12 autostrada (toll road) that runs along the coast from the French border. Free parking is available outside the center or there are many paid parking places in town. The closest airport is Pisa, about 15 miles away.